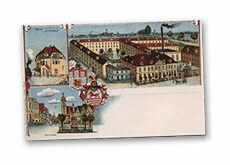 have been stored in Blümchen's archives for more than 25 years. 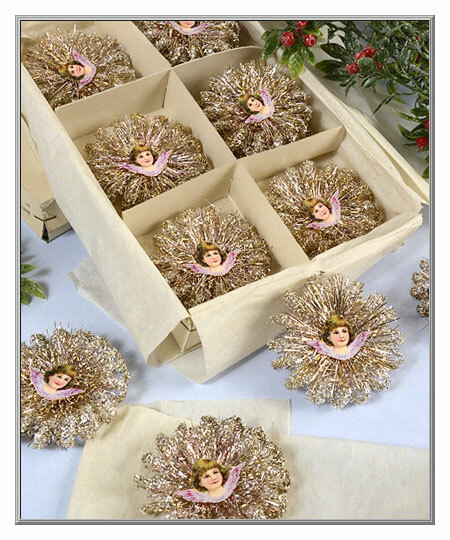 We are pleased to share this treasure trove of rare tinsel trims from our own collection. 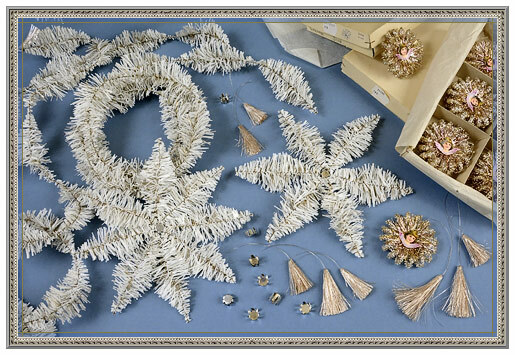 These highest-quality metallic tinsel trims, tassels and stars were produced in Germany and Austria in the time-honored fashion on the original old machines that date to the late 19th century. Regretfully, both of the European factories that created these most traditional of Lametta tinsel trims have closed their doors for good, which is especially sad because the German firm was established way back in 1689, and the Austrian family company was founded in 1802. These metallic trims will oxidize over time. Our vintage Lametta offerings, most especially the real silver plated tinsels, may all show varying degrees of tarnish, which gives the tinsel trims an aged, antique appearance. These wonderfully rare "snow" roping wired trims were offered to us when the company that manufactured them closed down in the 1990's. Stored undisturbed in the factory's attic for decades, the owners were amazed to find this old stock that they estimated had been produced back in the 1950's. These unique, large roping bumps are made from a combination of an early type of plastic fringe with fine filaments of Lametta tinsel. Do note that due to their age, the gold tinsel has darkened to a bronze tone, while the real silver plated tinsel now has a gilded hue. 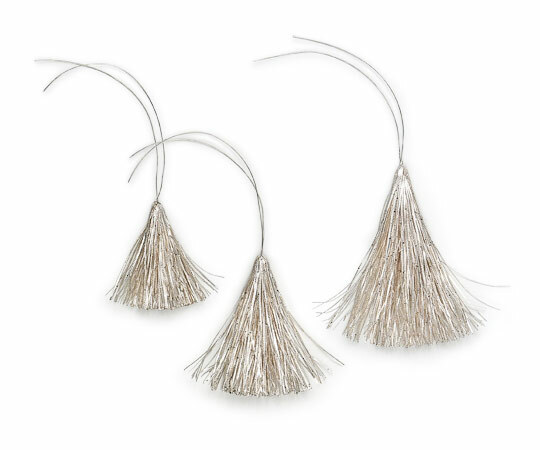 These gorgeous Austrian tassels were made from a rare patterned Lametta! 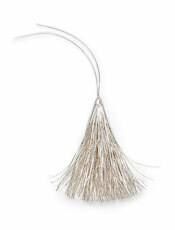 shimmer, these extra-full tassels all have approximately 300 strands. 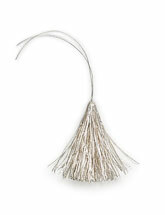 Silver Tassel ~ 1-1/2" ht. Silver Tassel ~ 2" ht. 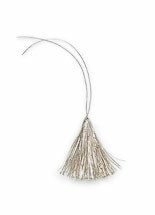 Silver Tassel ~ 2-1/2" ht. 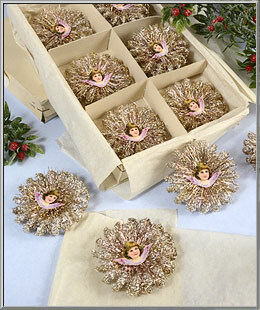 This rosette swirl of tinsel roping has a central halo of gold, pink and silver Lametta with a sweet angel scrap in the center. A vintage ornament that's so charming on a Christmas tree, it's 30 years old. Gift boxed. a truly aged, old-time look. Rosette is 2-3/4" by 3/4" deep.